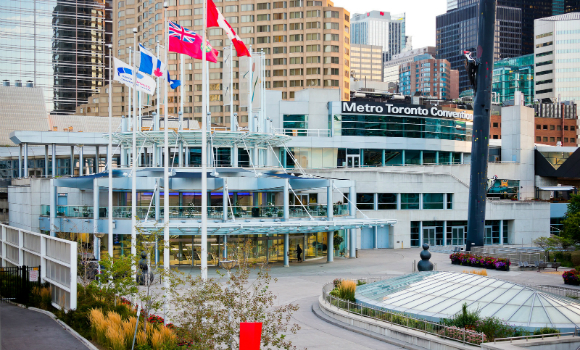 Last year, the Metro Toronto Convention Centre saw 1.5 million conference goers, event planners, salespeople, presenters, exhibitors, speakers, tech workers and myriad other people and professions stroll through its massive atrium in downtown Toronto. Week to week the MTCC shifts from the centre of one professional universe to another, enabling thousands of people at a time to gather, network and transact. It amounts to a lot of commerce for the out-of-towners and Toronto both. Last year, the MTCC reported that it generated $594 million in direct spending economic impact for Toronto, along with sustaining 7,622 local jobs and contributing $155 million in federal and provincial taxes. They’re impressive numbers earned amongst stiff competition. Located in downtown Toronto, near the foot of the CN Tower and the Rogers Centre, where the Maple Leafs play, the MTCC competes for conventions and conferences against the likes of London, Singapore, Geneva and other world-class destinations, against which every edge is sought. In Toronto, that edge is food. The MTCC kitchen’s commitment to sourcing local ingredients and emphasizing scratch-made, in-house preparations have become its hallmarks. Right now, 65 per cent of all the food and beverage making its way onto MTCC plates and glasses is locally sourced, including 75 per cent of the meat, fish and dairy. The wine list is crowded with Canadian labels, which claim 80 per cent of the space. At 45,000 bottles sold in 2017, it’s a boon to Canadian vintners, both in terms of money spent and exposure to an international crowd. Craft beer is also becoming increasingly important, as well. It’s a commitment to local sourcing rarely seen outside of smaller independent restaurants, and a step up in an industry that typically outsources its culinary programs, and for good reason: the scale is massive. On a capacity night, the MTCC will serve anywhere between 8,000 and 10,000 meals — the kitchen put out 12,000 meals on one night during the Microsoft Worldwide Partner conference — with 30 full-time cooks, 20 part-timers and a handful of temporary staffers. It’s a logistical undertaking that most conference centres happily eschew. “Not a lot of convention centres are self-operating,” says Richard Willett, the MTCC’s vice president of food and beverage. “In Canada, you can count them on one hand. In North America, you can count them on two hands.” The local focus is a doubling down on the MTCC’s original value-add. The dining program was always meant to be handled in house, but despite the enduring rarity of convention centres maintaining their own dining programs, other operations nevertheless crept up on the MTCC and blunted its competitive edge. The overhaul is the joint brainchild of Willett and executive chef Duff Lampard. Willett joined the MTCC in 2005, coming from the Westin Nova Scotian. Before that, he cycled through both back and front of house jobs in restaurant fine dining during the oil boom. Lampard, before taking on his current role at the MTCC, ran the day-to-day at the Westin Harbour Castle in Toronto, which followed a teaching stint at his alma mater, George Brown College, and an operations role in England, where he looked after 18 restaurants. Both have ample experience handling large operations, but the MTCC was of a different order. Start to finish, Willett and Lampard envisaged a three-year plan, overhauling everything. There was no tweaking, no adjusting — committing to a menu driven by local ingredients required a gut job. “We started all over again from a shell,” says Lampard, with the idea of creating a fine dining, plated-service experience on the MTCC’s massive footprint. With support from the board, Willett and Lampard ripped out the kitchen, replacing it with new, high-end gear and training up the team, getting them on board for the tumultuous few years of change. Lampard leveraged his connections around town and developed new ones to fulfill the scale of the project, which led to comically large buys. “In the spring, I’ve cleaned out entire fields of ramps,” says Lampard, laughing. Operationally, Lampard says he has adopted a “back to basics” approach, again borrowing the practices of boutique restaurants and scaling them up to feed thousands. At any given time, 3500 to 4000 locally-sourced proteins are dry-aging in house. Salumi is taken care of in house, too. Herb gardens, complete with an irrigation system, were installed on the MTCC’s roof, along with bee hives that, yes, produce honey that, yes, the MTCC uses. Ontario fruit and vegetables — fields a ramps included — are preserved on as close to an industrial scale as one found outside of a factory. It’s not all for show, either. Lampard says he gets a sizeable return on investment for the labour his team puts in, avoiding the middleman-added costs he’d otherwise be on the hook for. Instead, he brings in great product and turns a profit by making it world class. Like it’s opening days, the MTCC’s competitive edge on food is sharp, and it’s proving to be more of a selling point than ever. In May, the MTCC reported securing 21 new conventions in future years, including 19 from outside Canada — a facility record on top of the 24 per cent bump in gross revenue over last year. It’s not purely numbers, though. The intangibles feel more impactful, too. The food has a genuine connection to place and social and environmental benefits. Attendees don’t just eat, they dine on what Ontario has to offer, and organizers can see that that has value beyond the dollars and cents of their events. The old adage is true enough: the way to someone’s heart is through their stomach. For the MTCC, it’s through thousands of them. This entry was posted in Event Operations, Food & Beverage and tagged food and beverage, local food, Metro Toronto Convention Centre, MTCC.